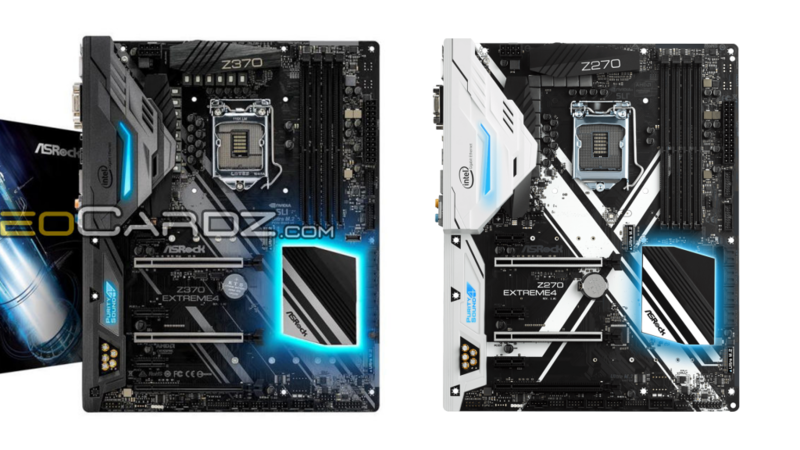 Today we have some interesting news on the Intel front in the form of six new motherboards rocking the yet to be released Z370 platform. 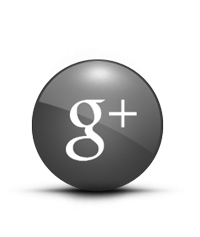 If you want some more information on the CPUs available for this platform read the article here. 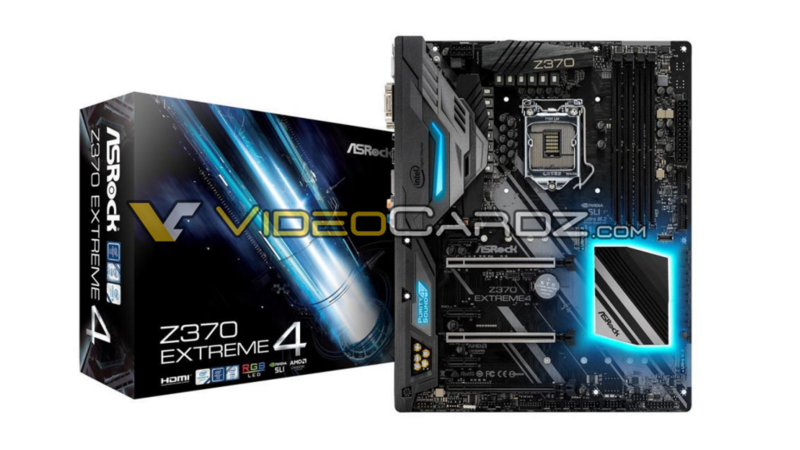 But this news hails from Videocardz as they managed to snag an exclusive look at these brand new boards. The first glance also gives us our best look at the new socket to date. There will be a few options from ATX all the way to ITX, so you’ll be covered for which ever form factor is your preferred choice. With these boards you’ll get your choice of either the Taichi, Extreme4 or Pro 4 variants. The first in the new lineup is the Z370 Killer SLI/ac. This is likely to be the mid range offering and could cost in the region of £150. That is just an estimation based upon the Z270 variant and we’ll know more when it gets announced. 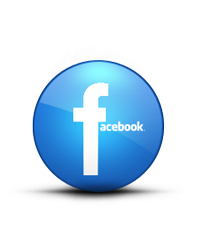 As for specs there is nothing to note as of yet, but it should likely offer an improvement over the last generation. The styling the board has changed though. 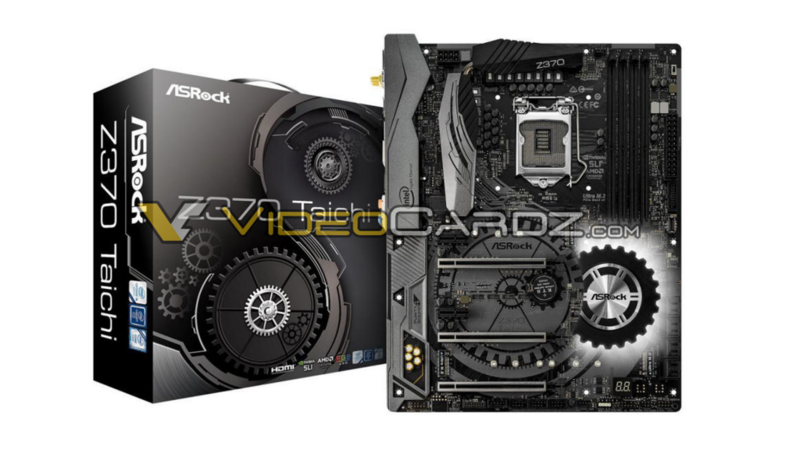 ASRock have ditched the White accents and gone for a more Gunmetal Grey. The PCB has a makeover too, gone is the White Killer logo and in its place is a new design. 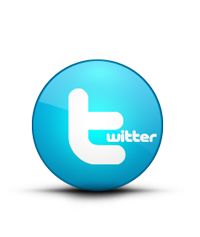 I quite welcome the design change, but that is just my preference. The chipset has also been altered to match the new design, but other than that, the layout looks pretty much unchanged. The next board is the Extreme4. This is one of the higher end offerings and will have extra features over the Killer SLI. 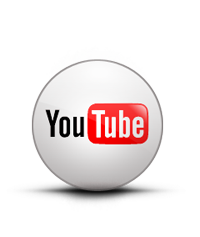 Pricing is of course not been released, but its likely to be close to £200. Again we’ll know more at a later date. 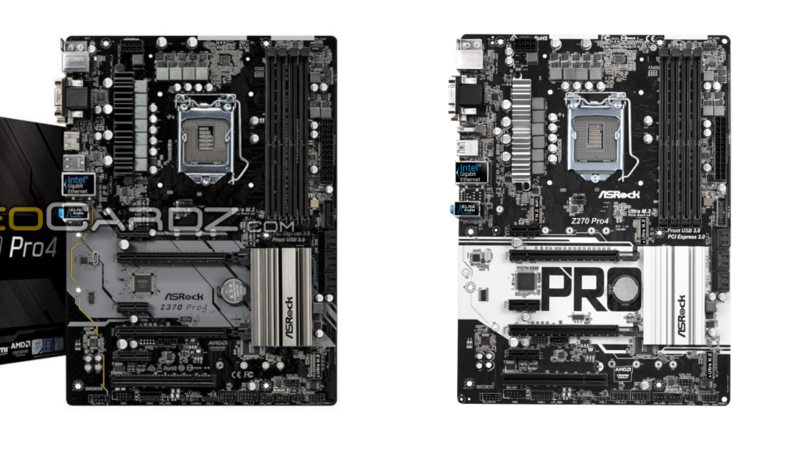 ASRock have given the board a fresh new look and have opted to remove the White. It looks like this something they’ve done to make the boards more cohesive. 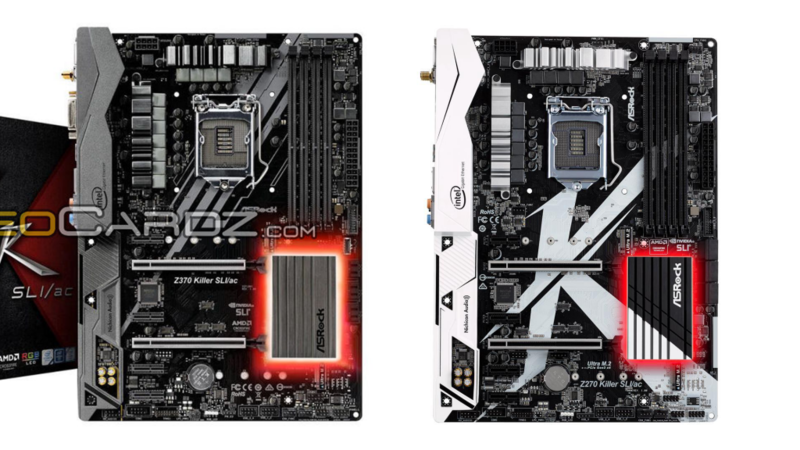 You can see the differences in the image below of the current Z270 board (right) and the newer Z370. 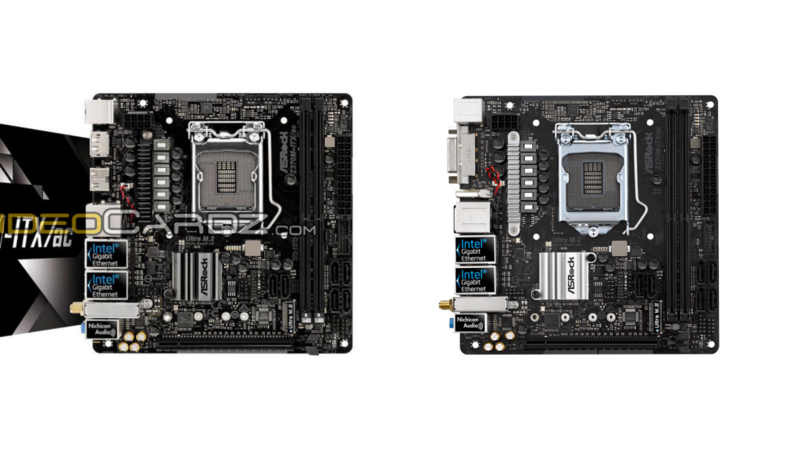 Like the Killer, the layout remains pretty much the same and it retains its dual M.2 as well as the same reinforced PCI-E slots, the same style chipset cover and IO shield. Next up is the Taichi. This again has seen a subtle transformation and is again in keeping with the darker theme ASRock have gone for. Pricing on this board again is not known at this point, but its likely to be over £200. Again that’s based on the current Z270 offering. There are a few changes here. It looks like ASRock have removed a full length PCI-E. Not sure why they’ve done this, but we’ll know more when further details are given. Also the M.2 placement has been altered and it also appears the vertical USB 3.1 has changed too. The final change is the design of the chipset. They’ve gone a more fitting gear shape rather than the previous squared off design. It sets the Taichi apart from the other offerings and gives it a more individual look. The next board is the Pro4. This is ASRocks cheapest ATX offering at launch and could likely be priced in the region of £100. Again that isn’t set in stone and we’ll know more soon. This again has been changed to fit the new design language of ASRocks new line. You can also see that it’ll be using Intels Gigabit Ethernet and ELNA audio. 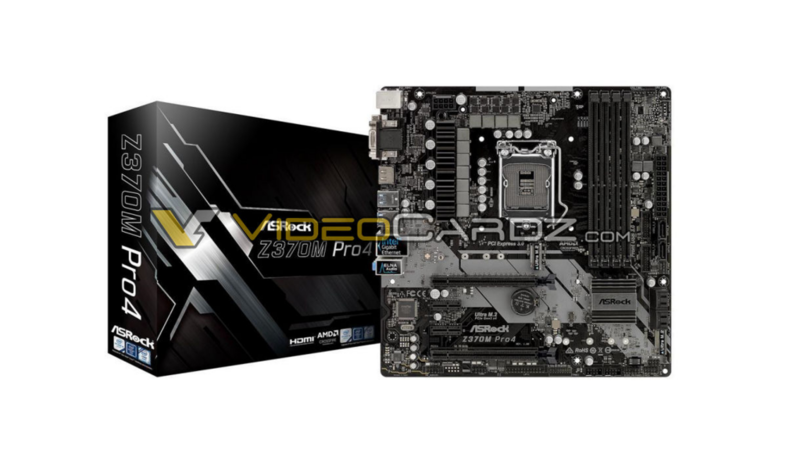 It also has two M.2 and pretty much the same config as the Z270. 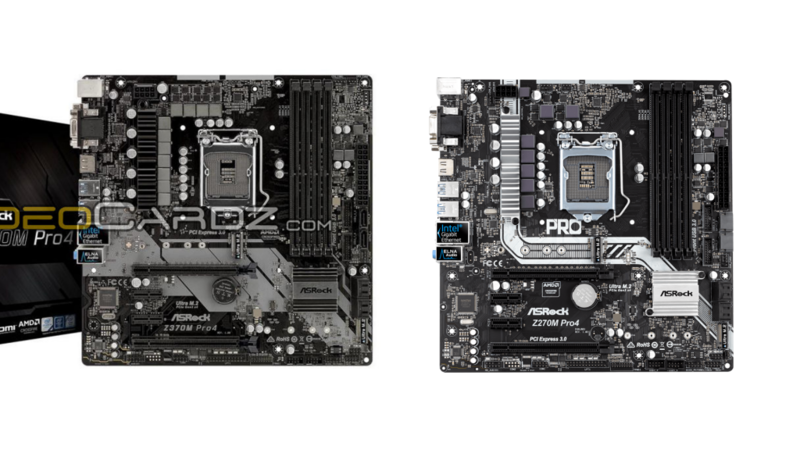 Below you can see the alterations ASRock have made between the Z270 and Z370. I for one like the changes as I was never to keen on the Z270s design. 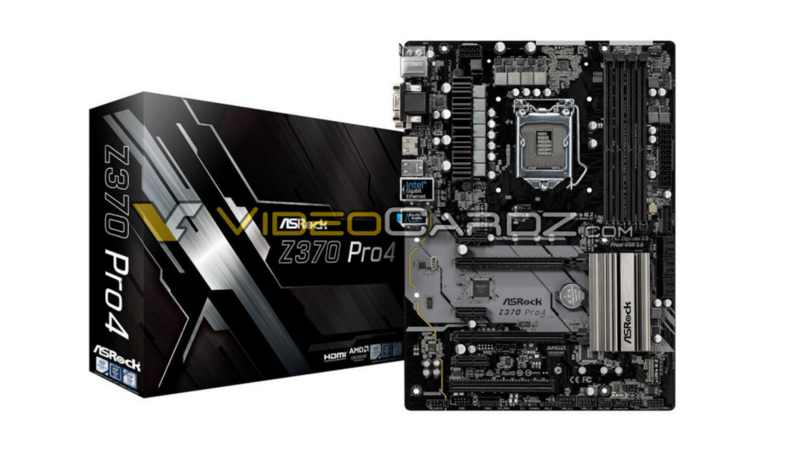 The MATX option will be the Z370M Pro4. 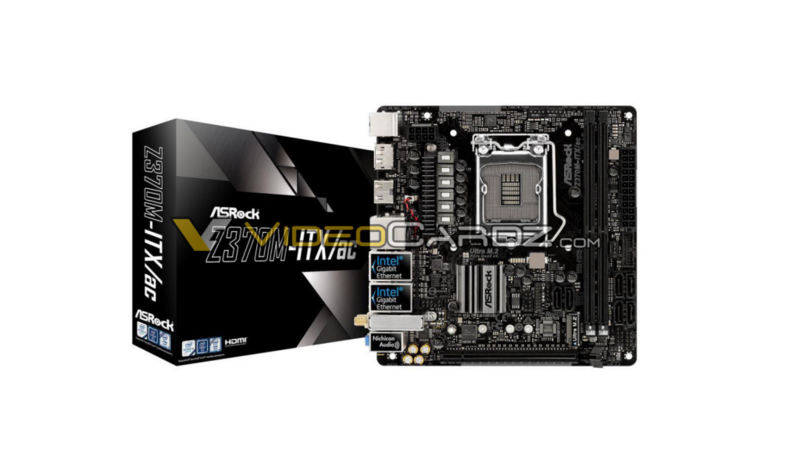 It will be the only MATX offering from ASRock available at launch. 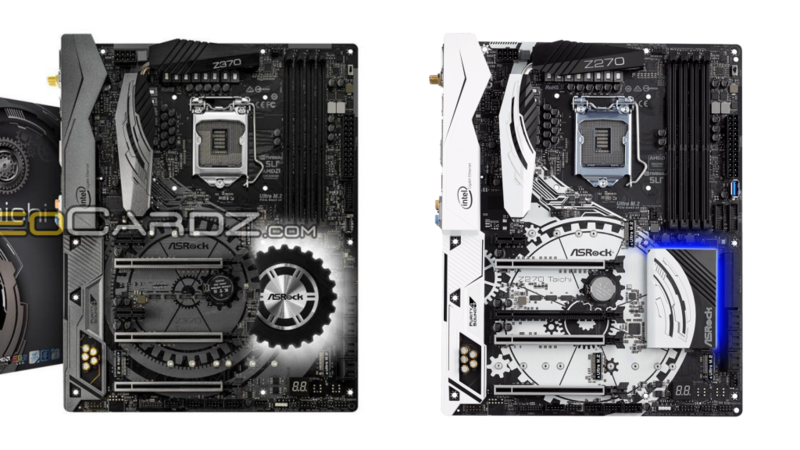 Pricing is looking to be around the £100 mark, again based on the current Z270. Like the Z270, it’ll be packed with the usual features. It’ll have two M.2 as well as Intels Gigabit Ethernet, ELNA audio and the same rear IO. So its looking like not much has changed on the hardware front, but again the design has be updated. The final offering is the ITX version. 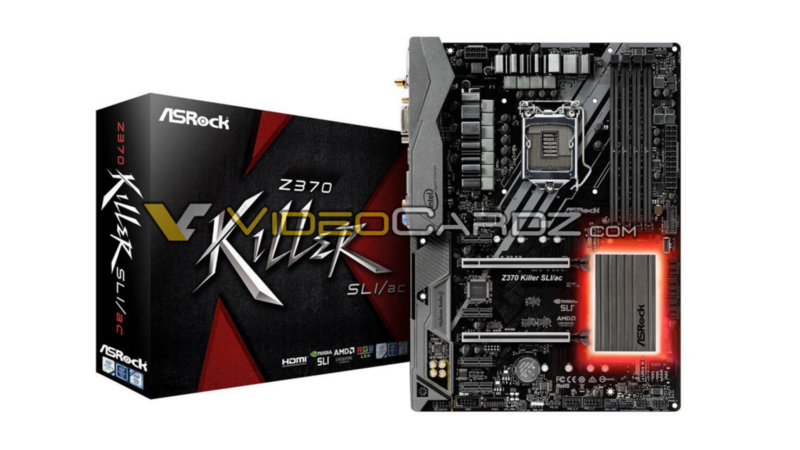 This will be named the Z370m ITX. It will be priced in the region of £130, so it won’t be cheap but it will have a good feature set for its compact size. It has a front mounted M.2, the same Gigabit Ethernet as the MATX, Nichicon audio, 6 SATA ports and a good featured IO. Design wise not much has changed at it looks almost the same as the Z270 version. I understand there isn’t a lot of space to work with on the PCB, but least the ITX board will sit nicely with the rest of the releases.